Osteopathic treatment for pain and injury. Trusted cranial osteopathy since 2004. We are a team of experienced osteopaths. At Brisbane Osteopathic Centre, we work with you to help decrease pain and improve mobility. All 5 of our practitioners use a very gentle balancing technique called cranial osteopathy, or biodynamic osteopathy to treat a broad range of complaints including headaches, neck pain, back pain, elbow or wrist injuries, sprained ankles and sore knees. This gentle technique allows us to treat very painful conditions because we don’t need to move or stretch patients in order to improve their mobility and decrease their pain. The ability to treat the patient gently means our team can work with you even if you are in severe pain, and we regularly treat babies, pregnant woman and the elderly. We also investigate preventative measures, to keep you pain free for longer. Our fully qualified, registered and highly experienced osteopaths have completed 5 years of university study and gone on to do further training in the Cranial Field of Osteopathy – studying the Biodynamics methodology. Our practitioners use the gentle approach of cranial osteopathy. Introduced until the final years of the undergraduate course our osteopaths have fine tuned their skills with hundreds of hours of post graduate training, around Australia and the World. We have all trained in the Biodynamic Approach to cranial osteopathy as taught by James Jealous, and our core team have all completed Phase 1-9 and various other courses including the Treatment of Children Phases 1-3. Each practitioner has completed further training in areas of interest as well as reading journal articles and research. We are all very happy to treat any patient who walks through our door, but we do have different clinical interests. If you’d like to find the right osteopath to help with your complaint, click through to Our Practitioners to find out more about us. 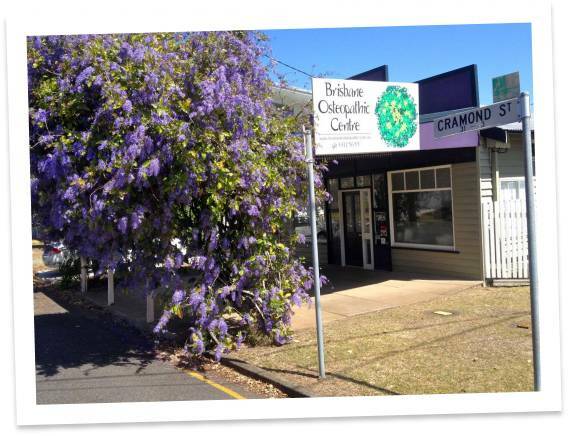 We are located at 3 Cramond St, Wilston, an Inner Northside suburb of Brisbane, just off Newmarket Road. Our proximity to the northern exit for the Clem 7 tunnel makes us quite easy to access from the southside of Brisbane. We are close to the Royal Brisbane Hospital, near Homezone Windsor. We have plenty of easy on-street parking available. Getting to us is easy with the Wilston train station and bus stops on Newmarket Road a short walk away. Click through to our Contact Us page to see a map. Private Health Cards Accepted – claims are processed on the spot. Medicare Chronic Disease Management patients accepted. Book an appointment now online or give our friendly reception staff a call on 3311 5655 between office hours 8.30am-5pm. Cranial osteopathy it is the name given to a subtle approach to osteopathy, where the osteopaths use thier hands to feel changes of tension and stress in the body. The osteopath aims to diagnose areas of strain or dysfunction which are causing pain and then stimulate the area to a state of balance, there-by restoring it to health. Osteopathy is a form of manual treatment for aches and pains. This means we use our hands to help you feel better. To do this we are looking at how your body is functioning. There might be a joint which isn’t moving as it should, or a muscle that is too tight or too loose. We then work using our hands to normalise those movements.